Protein microarray is a screening tool that reproducibly detects serums reactivities to non-HLA antigens. (A) Data normalization approach for two representative serum samples from two different patients. Raw signals are shown on the left. Unmanipulated positive control (red) and negative control (black) signals are shown in the next panel. The third panel depicts the signals for normalized positive and negative controls. The final panel on the right shows post normalization histogram for all reactivities. The vertical dotted line in the right two panels is drawn at log210. The numbers refer to percentages of reactivities above log210 threshold. (B) Assay validation with positive control sera. Normalized signal values are plotted for positive control serum (closed circles) and four healthy control serum samples (open circles). The horizontal dotted line is drawn at the significance level of log2 10. (C) Assay variability. Representative Spearman plots of a single serum sample tested on three separate arrays. Spearman plots comparing pairs of arrays with a mean tau of 0.90. The experiment was repeated twice with comparable results (data not shown). (D) Effects of serum dilution. The left panel shows box plots (median, 25th and 75th percentiles) for four different dilutions of the same serum sample tested on four separate arrays. The dashed box surrounds the dilution recommended by the manufacturer. Median reactivity for each array titrates down with serum dilution. 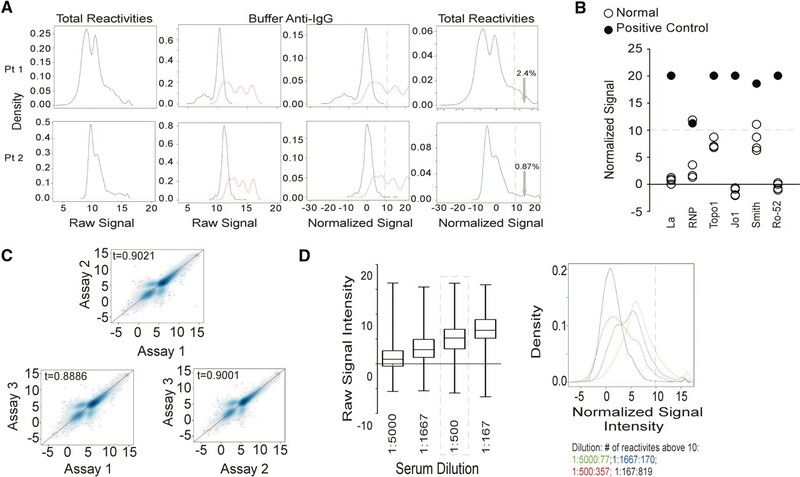 The right panel shows signal histograms with numbers of significant reactivities >10 for each dilution. Transplantation induces new antibodies reactive to non-HLA antigens. (A) Representative Spearman plots depicting antigen reactivities in two serum samples obtained 12 months apart from a normal volunteer (left panel) and pretransplant and 12 months post-transplant from an individual transplant recipient with stable kidney function (cohort 1, middle panel) and an individual transplant recipient with TG (cohort 2, right panel). (B) Median spearman tau correlation coefficients for each group. The P values were determined by Mann-Whitney U test. Microarray analysis identifies three putative biomarkers for transplant glomerulopathy. Shown is a Venn diagram depicting the overlapping reactivities in sera from patients with stable kidney function (Cohort 1, left oval) and from two different cohorts of patients with TG (cohorts 2 and 3, middle dashed oval and right oval, respectively). Thirty-seven reactivities were found in cohort 2 but not detected in any of the cohort 1 patients. Of those 37 reactivities, three were also detected in each of the patients in cohort 3. Patients with TG specifically have serum antibodies reactive to PECR. (A) Anti-PECR ELISA. (Left panel) Serum from one representative patient with TG was diluted 1:100 and 1:500 and tested in an anti-PECR ELISA in which plates were coated with PECR (41 or 14 nM) or without PECR (0 nM). The mean values of triplicate wells are shown. (Right panel) Sera (1:100 dilutions) from 28 individual patients (20 with TG and eight with stable kidney function) were tested for reactivity to two PECR and a control protein, CSRP2 at 14 nM. (B) Anti-PECR reactivity detected post-transplant. Individual ELISA results for anti-PECR reactivity tested at 1:100 dilution (left panels) or 1:500 dilution (right panels) in patients with late TG (cohorts 2, 3, and 4) and stable kidney function (cohort 5). The wells were coated with 14 nM PECR. Arbitrary thresholds for positive values are shown by the dashed lines (OD 0.5 at 1:100 dilution and 0.4 at 1:500 dilution). (C) Pretransplant anti-PECR ELISA. Pretransplant sera obtained from patients with late TG (cohorts 2 and 3) and a randomly selected group of 37 patients on the transplant waiting list were tested for anti-PECR reactivity (1:100 serum dilution, 14 nM PECR). The dashed horizontal line represents the threshold of OD 0.5. Medians were compared by Mann-Whitney U test. (D) Individual pre- and post-transplant anti-PECR reactivity by ELISA. Each line represents the pre- and post-transplant serum reactivity for PECR for the 12 patients from cohorts 2 and 3 (extracted from panel C). ↵aNumber of patients with anti-donor HLA antibody/total number of patients in the group. ↵bThe data derive from an ongoing study (CTOT01, www.ctot.org), and the results are unvalidated. ↵cNo available data on four patients. ↵aNo common reactivities are shared between any two patients. ↵aThree reactivities are shared between two individual patients. BC016330.1-RAD51-associated protein 1 (RAD51AP1) and NM_032349.1-nudix (nucleoside diphosphate-linked moiety X)-type motif 16-like 1 (NUDT16L1) are shared between patients 2 and 5. BC014394.1-A. T hook DNA-binding motif-containing protein 1 is shared between patients 2 and 3. ↵aTwo antigen reactivities are shared between two individual patients. NM_024068.1-oligonucleotide/oligosaccharide-binding fold containing 2B (OBFC2B) is shared between patients 8 and 10 and BC021622.1-phosphoinositide-3-kinase, regulatory subunit 3 (p55, gamma) (PIK3R3) is shared between patients 3 and 4. ↵aTissue expression patterns found by GenBank/GeneCards search and http://biogps.gnf.org; http://www.ncbi.nlm.nih.gov/geoprofiles (GEO ID# GDS899, GDS3397, GDS1453, GDS2534, and GDS1892).